A 16" high bust of high fired bisque. Hand painted patina finish. Mark Twain was known for his wit and wisdom. The son of a judge, he became a profound and influential writer. His ability to produce such classics as TOM SAWYER, HUCKLEBERRY FINN and many others, proved him to be a great master story teller of our age. Although Twain was confounded by financial and business affairs, his humor and wit were keen, and he enjoyed immense public popularity. At his peak, he was probably the most popular American celebrity of his time. This work appropriately is awarded to comedians, writers, lawyers and other members of the legal profession, and is a tasteful tribute to achievment. Adding this sculpture to your office decor or home library will be a lasting tribute. Words cannot express how deeply moved I am by your very personal, very beautiful work. 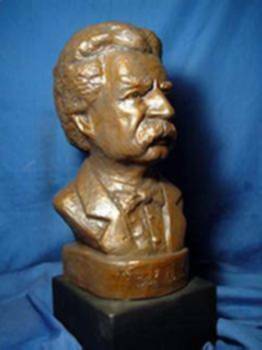 A more proper thank you will follow in the U.S. Mail, but I needed to let you know immediately how much I love the breathtaking sculpture of Mark Twain. I also love the "Blind Justice" card holder. It is wonderful! I brought both items to my chamber today and the attorneys were in awe of your talent. I was most proud in announcing your dear friendship to all who inquired, and even to those who didn't inquire! The personal inscriptions on both pieces of art and the fact that I now have the privilege to enjoy the #1 sculpture of Mr. Twain with your autograph is so very meaningful to me that I cannot put it into words. My father, who died only six months ago, always told me since I was a young boy that the world is basically good and full of genuinely kind people. Well, as the years have passed, and particularly through my job, I have often had reservations about his remarks. But Robert... the beautiful art you create, the expression of your friendship and the wisdom you impart in our wonderful conversations affirms my belief that my Dad was talking about you. Thank you for your kindness, friendship, generosity and the sharing of your soul through your many talents as an artist! A 10" bust is also available.